I saw this beautiful scan of Lacus (I still need to watch this show, had to research her name) and rendered the background to adapt the image for wallpaper dimensions. I blended the scan with the nice background andI placed some special effects (sparks, spheres, etc) and finally, just placed the logo....Feel free to comment about it and enjoy! Visit my website, www.cartoonleap.com for more stuff and deleted ones from here, Thanks! anyway the bg is great! lacus, pretty and cute, but a tratior (sp) anywho, love the pic, the colors are awsome. Really nice wallpaper. I wondered why anyone hadn't done one with the scan of this two. 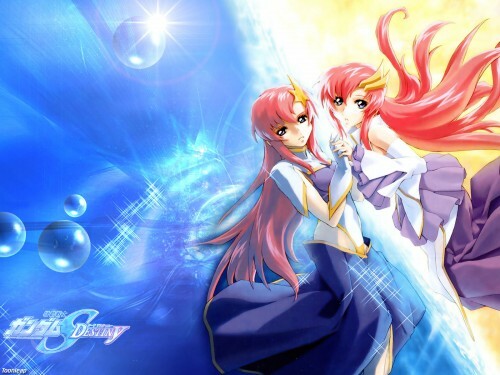 It's a really cute scan though I don't like Mee (left one) but I love Lacus (right one). Great background with soft colors for the scan and the logo looks better than usual. Great Job and hope to see more of Gundam Seed Destiny wallpapers! Two cute girls (one of them being Lacus - my fav of course XD) + great bg. Fav'ed. Uwahh~~ Sugee !! Nice wallpaper with Mia and Lacus.Luv the soft tones. Otsukaresama !! I like how you did this! Seen the Scan too and thought about a nice wallie or something, but never came up with it. i like the bg colors. not fond of mia campbell but i oddly love the scan you used. great job! I love the whole opposite/reflection thing you did. Not entirely sure which side I like better though. Meer had an awesome blue background, but I like Lacus better. one of the finest image i've seen so far. That's a nice wall. I'm happy to have a nice wall with Meer when she looks nicer than Lacus. Beauty scan and nice background. Good work. + favs :D Keep it up.